Saturday is usually market day and this past one was no exception. I didn’t have a menu in mind but then the market can inspire, especially Saturdays when the farmers are in the north side of the St. Lawrence Market. All of that Fall bounty just waiting to be picked up, cut, sliced and cooked into a plethora of options for our plates. My olive oil supply was running low, so my first stop was going to be Olive & Olives. I wanted an everyday olive oil for a Greek marinated olive recipe that I hadn’t made in a long time. I love the fact that you can taste most of their product before you buy because I was looking for an olive oil that would be buttery and not overpower the coriander, lemon and garlic that I wanted to add to the green olives. 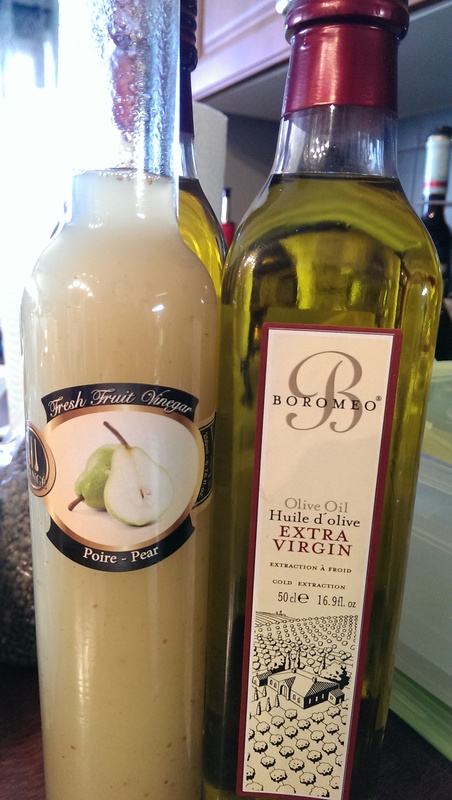 Boromeo Extra Virgin Olive Oil was the perfect fit with its mild, fruity taste with a bit of a peppery note at the end. After helping me to select my olive oil, Manager Tal, pointed out a new line of Fresh Fruit Vinegars that had arrived at the store and I have to say… they looked very fresh and tasty. After taste testing a couple I decided on the Pear Fresh Fruit Vinegar. The backs of the bottles also give suggested pairings for food and drinks. Do I see some creative Pear-ings in the near future? I naturally had to take a tour of the rest of the store and was hoping to pick up a bottle of Persaillotte, a delicious blend of dried parsley, garlic and shallots… drat! Sold out!! This blend is amazing on just about anything and I particularly love it on omelettes and chicken. I’ll have to use what I have left veeeerrrrryyyyy sparingly. 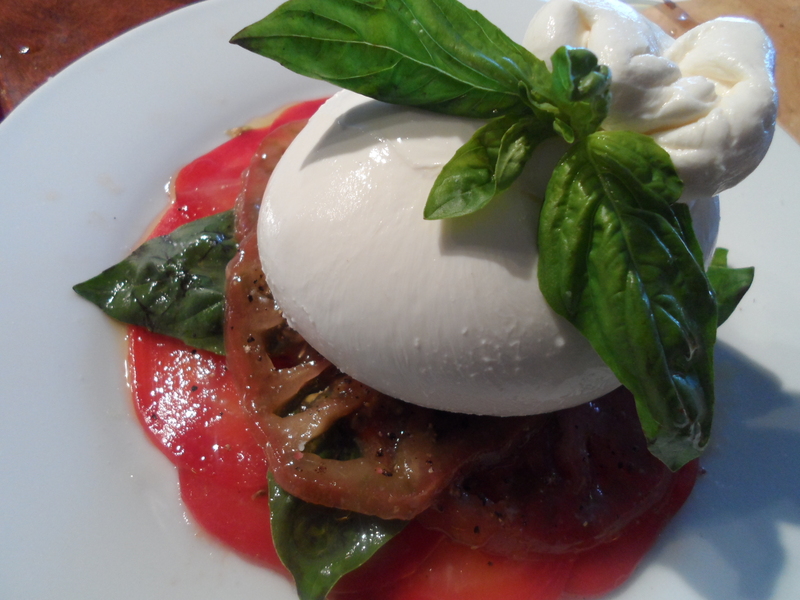 Heirloom Tomatoes, Candy Cane Beets, Burrata & Basil. 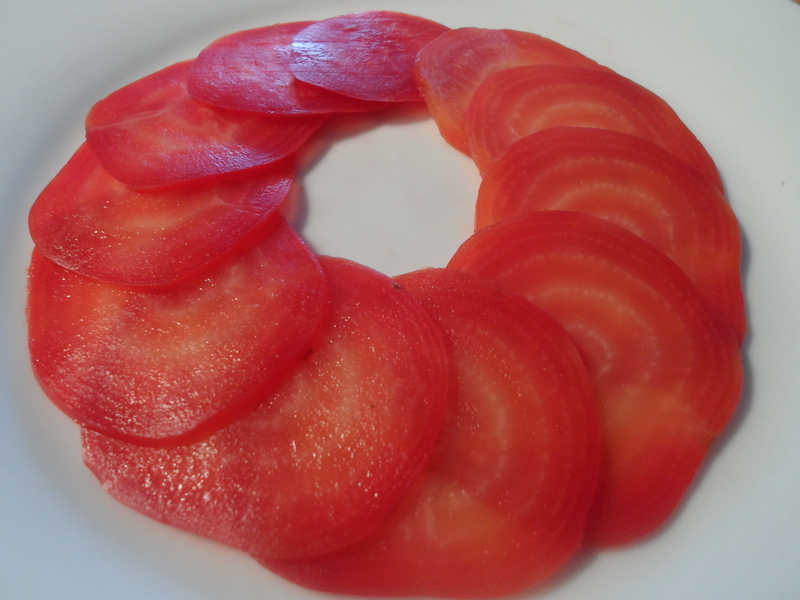 I roasted the beets and peeled them (you can also boil them until tender) then thinly sliced them. 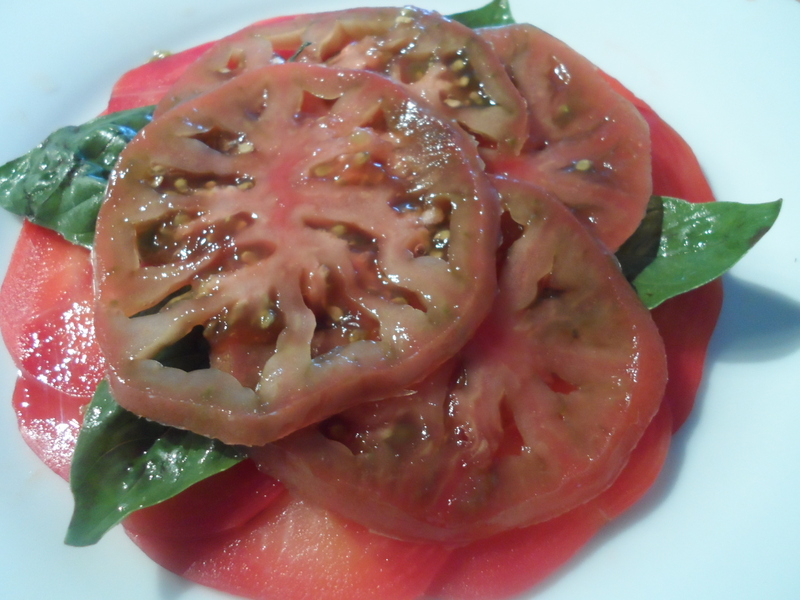 Next layer was slices of the heirloom tomatoes and a bit of torn basil. Soooo tasty when I drizzled the bottom layer with my new Pear Fruit Vinegar, Boromeo EVOO, lightly dusted Sel de Mer salt flakes, cracked a bit of pepper and gently placed the Burrata on top …. yuuuuummmm! Now what am I going to prepare for the main dish? Posted in appetizers, condiments, local stores, Olive & Olives, St Lawrence Market, vegetables, vegetarian recipesTagged Extra Virgin Olive Oil, Fresh Fruit VinegarsBookmark the permalink.